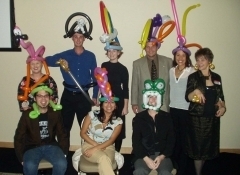 Sure, balloons have been traditionally associated with children’s parties and other family events, but they can also be lively additions to office events, holiday gatherings, or retirement celebrations. Grown ups don’t need an excuse to party, but they could always use a little help to make the night even more memorable. That’s where John and Johnna come in. Why should kids have all the fun?